review Vernor Vinge’s 2006 book Rainbows End constitutes a veritable cornucopia of dazzling ideas about where the current crop of web 2.0 technologies such Wikipedia and Google could be leading human society, strung together with a well-planned plot that aspires to explore the sort of trans-human ideas that similar authors like William Gibson favour. However, the selection of a 75-year-old man as the main protagonist enforces a sometimes glacial pace. And readers who prefer their science fiction to use the evolution of technology to better understand what it truly means to be human will finish the novel feeling Vinge’s ideas only go skin-deep. The book does a fantastic job of probing the human cerebellum … but not the human soul. The main character of Rainbows End is Robert Gu, a world-famous poet and an unlikely man to be forced to grapple with the latest next-generation technology. Gu has always preferred paper and a pen to Wikipedia. But when he awakens from a twenty year sleep in the year of 2025, with the Alzheimers’ disease that took him out of action cured due to new medical research and much of his physical and mental frailties similarly taken care of, it’s technology that Gu must confront. Digital paper and clothes that let you interface with the 2025 version of the internet, augmented/virtual reality, an economy heavily based on the fusion of content and software production … pretty tough going for a 75-year-old, even with the help of his grand-daughter Miri and her fellow school student Juan Orozco. When Gu and much of his immediate circle are drawn into an elaborate plot involving a mysterious, probably artificial intelligence known only as Mr Rabbit and international security implications, the parallels between Rainbows End and Lewis Carroll’s subversive 1865 book Alice’s Adventures in Wonderland are too many to ignore. Gu is lost in a world he barely understands, grappling with confusing and contradictory forces. In some ways, Vinge is wise to use the naïve Gu — a man who even back in 2005, found computers hard to understand — as a lens through which to gradually gain a full picture of what 2025 might look like, with internet starting to realise its true full potential as an immense knowledge-gathering and information creation machine. This character device, I can imagine, would be particularly useful for readers who perhaps don’t spend so much of their day online, both at work and at home, as today’s Generation Y does, or who aren’t comfortable with the sorts of concepts commonplace in the amazingly popular Japanese manga and anime Ghost in the Shell. And of course, Vinge can use the viewpoint of the technologically adept youngster Miri when Gu’s headspace gets a little frustrating. However, ultimately I felt that the choice of Gu as the main protagonist hamstrung the book, due to the slow pace it enforces upon the development of the story. Many reviewers have described Rainbows End as a roller-coaster ride, with dozens of new concepts being thrown at the reader every few pages. Nothing, in fact, could be further from the truth. The ability to access all kinds of data on the run is not new in the middle of this decade; devices such as iPhones, BlackBerrys and laptops have made this a virtual normality. But while Gu is still stumbling around trying to understand how that concept has become entrenched into all forms of human perception, the reader starts to become bored. Personally, I wanted to know about the advanced members of the technological society in Rainbows End, not the bumbling experiences of Gu, who at the start of the book, can barely find his way around Microsoft’s year 2000 operating system Windows Me. I always had a feeling that the really interesting characters in the book were operating behind the scenes of the plot. Turning to the plot and character development of the book, similar problems can be found. When writing Neuromancer, which shares many ideas with Rainbows End when it comes to both plot and technology, William Gibson was forced to work at breakneck speed due to the one-year deadline on his book contract, and the need to get enough work to feed his family. That speed, and the influence of JG Ballard on Gibson, fuelled the lightning pace of his book and drove reader excitement. 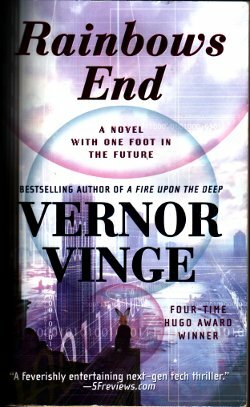 In comparison, Vinge took no less than seven years to publish Rainbows End, after his preceding book, A Deepness in the Sky, was a Nebula and Hugo award nominee back in 2000. The lengthy genesis of the book shows; in my opinion, Rainbows End is over-edited and over-thought. Instead of going with his feelings and raw gut instinct, Vinge’s painstaking writing approach makes the book feel dry. A book of this type should feel fresh and challenging. The plot is meticulously laid out. But reader interest in it suffers because of a lack of character development in the book. In fact, many of the characters are almost cardboard cut-outs … the shadowy organism hinted at being an artificial intelligence, the government security types, the Gen Y youngsters etc. The last problem with Rainbows End is the lack of deeper philosophy behind it. The technology found in Neuromancer is not ever examined closely; Gibson forces the reader to take it for granted, at face value, and then shifts the readers’ focus to the implications of the adoption of that technology on human nature itself. Vinge does attempt this feat in Rainbows End, with some limited success. But in general, I feel he didn’t look into the human psyche closely enough; perhaps a failing drawn from his similarly dry background as a professor of mathematics and computer science. The glory of science fiction is its focus on future world, technologies, and intelligences. The irony of science fiction, an irony I would argue Vinge does not yet completely understand, is that the best science fiction uses those worlds to illustrate purely human stories and better illuminate an-age-old question: What it means to be human.